Where to go to for a good selection of tops is one of the questions that I get asked most often. If your wardrobe is short of tops, you really do know about it. That's because rather than wearing dresses, jumpsuits, or playsuits most of the time - which clearly don't require a top - we tend to live in jeans and trousers, or occasionally skirts, which clearly do. And when the weather suddenly starts to get warm, whilst it might be a quick and easy transition from jeans to chinos, we often feel the need for a "new top" to spruce things up. Those old T-shirts that have sat languishing at the back of the wardrobe just don't cut the mustard do they? So here's my selection from Oasis - a veritable one stop shop for tops. Plus they have now started stocking clothes from a 6 to an 18, so if previously it wasn't a shop that worked for you, now might be the time to take a look through a fresh pair of eyes. Starting off with the most simple of tops, the cami. Great either on its own or for layering under other tops to "fill the gap" - usually the modesty one that is. This top comes in 6 colours, so there's something for everyone. Next, those ubiquitous stripes which appear season after season. But these aren't any old stripes - these are stripes with flamingos and sequins. I like this because it's a little more than a T-shirt but it's not fancy enough to call itself a "top". And there is a difference! Next up, pineapples. 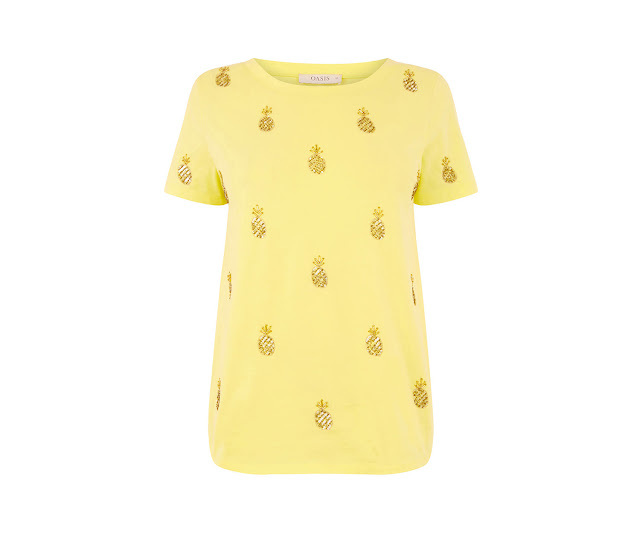 There are lots of us having a love affair with all things pineapple related right now and Oasis have tapped into that with this fabulous yellow T-shirt with sequinned pineapples. 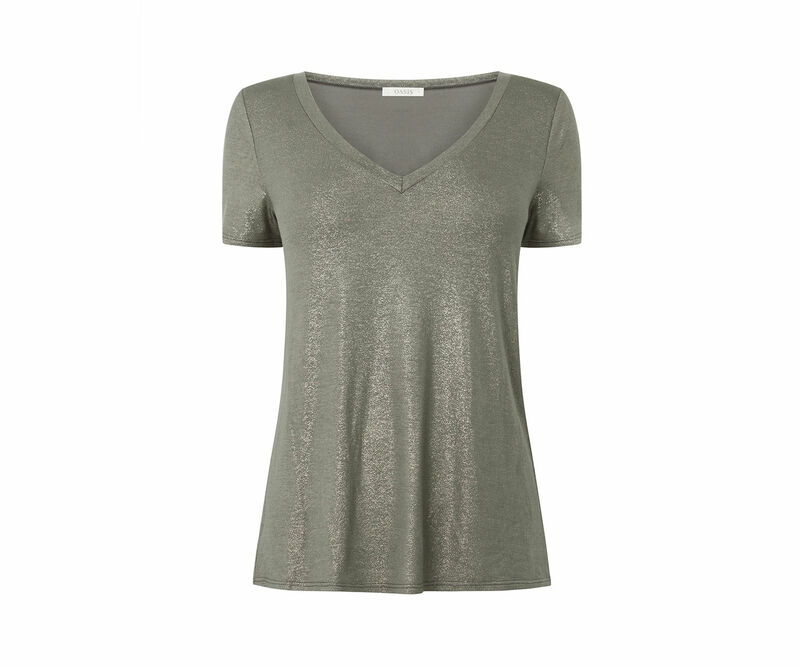 A glitzy T which hits the right spot for those after something a little more embellished than a plain T but not something too over the top. Personally I love a statement skirt and a glitzy T.
Now we're talking! Full on sequins - and let's not just keep them for the evening. You all know what a daytime sequin fan I am. 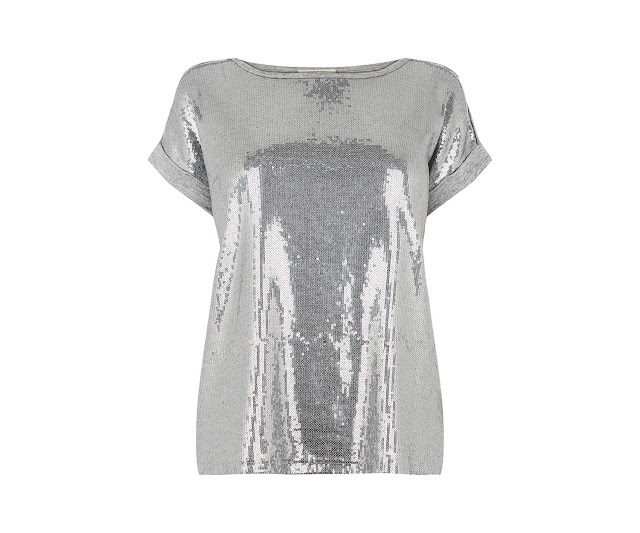 There's just something lovely about a sequin T-shirt, whether it's with jeans, under dungarees, with shorts, chinos, a pleated skirt, or a pencil skirt and heels. 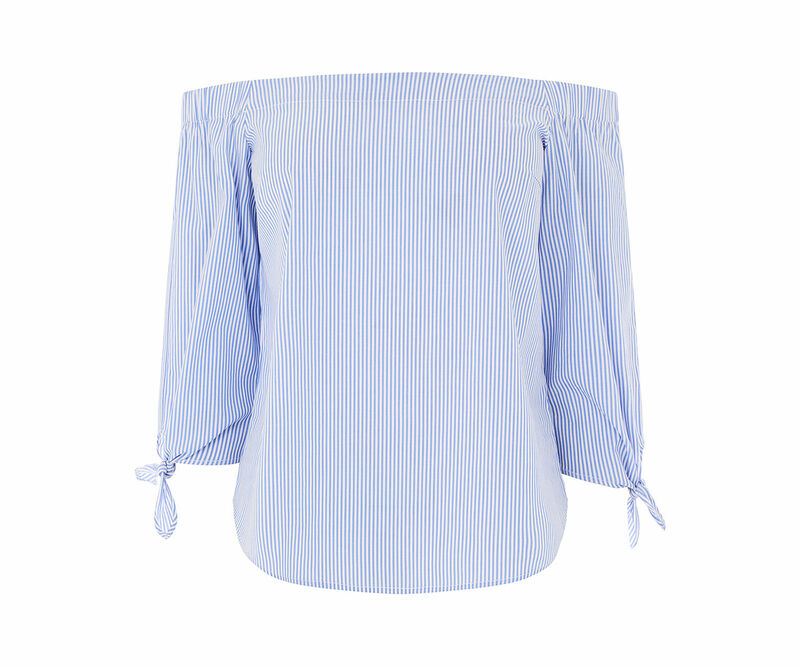 And of course a fashionistas wardrobe wouldn't be complete without a blue and white striped bardot top. Which is why I haven't got one. I'm not so good with off the shoulder - I still haven't worked out how to empty the dishwasher or hang the washing up without moving my shoulders. BUT I love them on other people and I often look at them longingly, wondering how others manage where I fail. Perhaps I'll have to stop someone and ask them. This top is a real gem for a curvier figure. 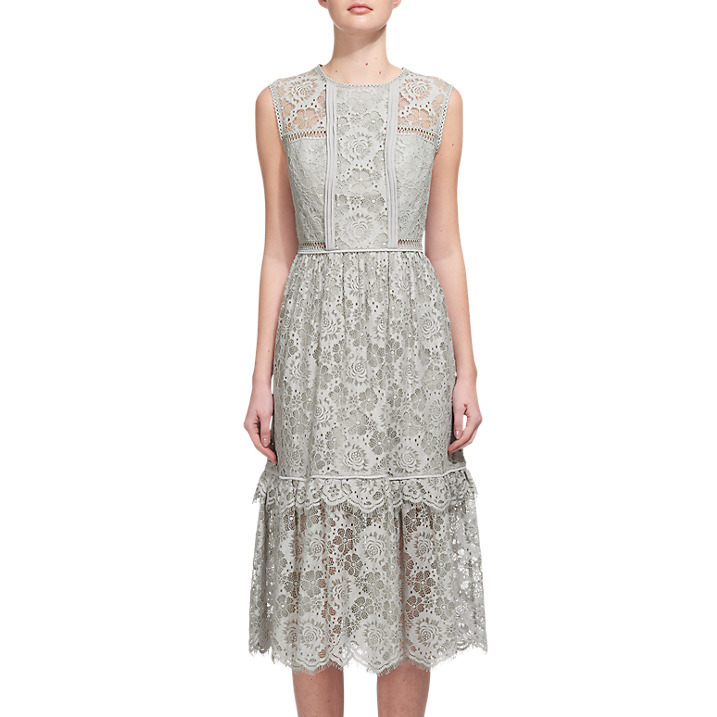 (Cue best Trinny and Susannah voice) - true, it might have the higher neckline but it's only a thin band. 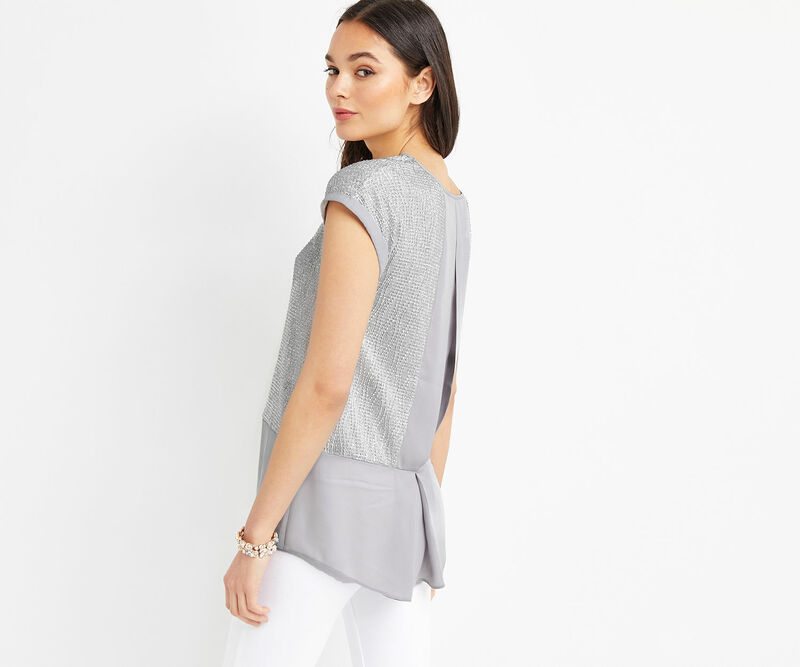 The V-neck has a fastening which prevents gaping, the fabric skims without clinging and then it nips back in at the waist with this wide band which stops all that wafting that you can get with voluminous tops and which aren't always flattering. The diagonal line across the torso is a good styling trick too as it draws the eye down and across, plus the print keeps the eye on the move. So if you're a lady with a curvy bust who struggles with tops, this could be worth a try. And then for anyone who wanted a "going out" top, this one offers a combination of different fabrics, a bit of shimmer and it's a good length, meaning that it's great over skinnies, or cigarette style trousers with heels. 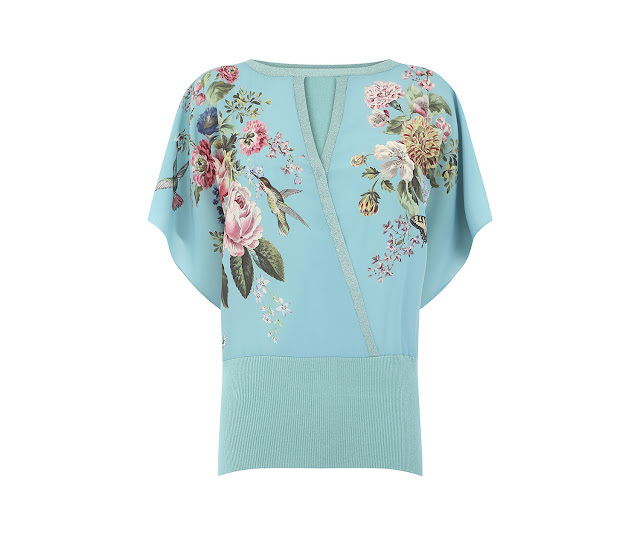 There are over 226 tops on the Oasis site and what I really like is the variety available. They're not all super trendy but there's definitely something for everyone whether it's a cool T, an everyday top or a going out top. And if all you have time for is a quick whizz into town, that's where I'd suggest you head. Have fun! We all know that the High Street is great at catering for the masses but woe betide you if you are taller, or shorter, or have a larger bust or curvier hips than those masses. Suddenly life becomes a whole lot trickier. The same is true for those ladies who have wider feet; for those ladies for whom shoe shopping is just a miserable experience because none of the shoes that they like will go on. 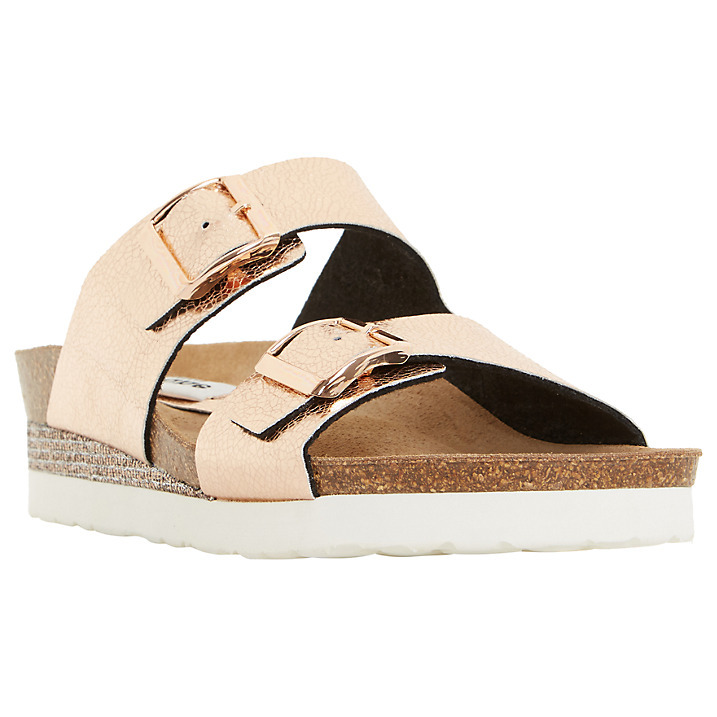 Well that's where the Dune Lucki double strap sandal from John Lewis (£65) comes into its own. I happen to love this style of shoe, wider feet or not. 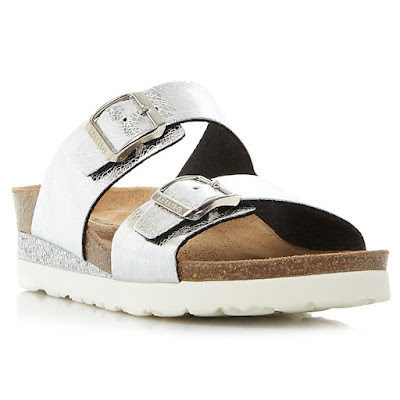 Metallic - rose gold or silver (tick), sparkle - on the heel (tick), flatform - for height (tick), slightly cool and Scandi (tick), comfortable (tick) and for those with wider feet, two buckles that actually function so as to accommodate a wider foot, which equals ticks all the way to the till. And I haven't checked but it's possible that they could be tightened significantly too, so they may accommodate a narrower foot - as well as an "average" foot. Excellent news all round! Let me know what you think. I hope that these could be just the gem you may be looking for this summer. A triple bill - something to wear, something to eat and something to do! 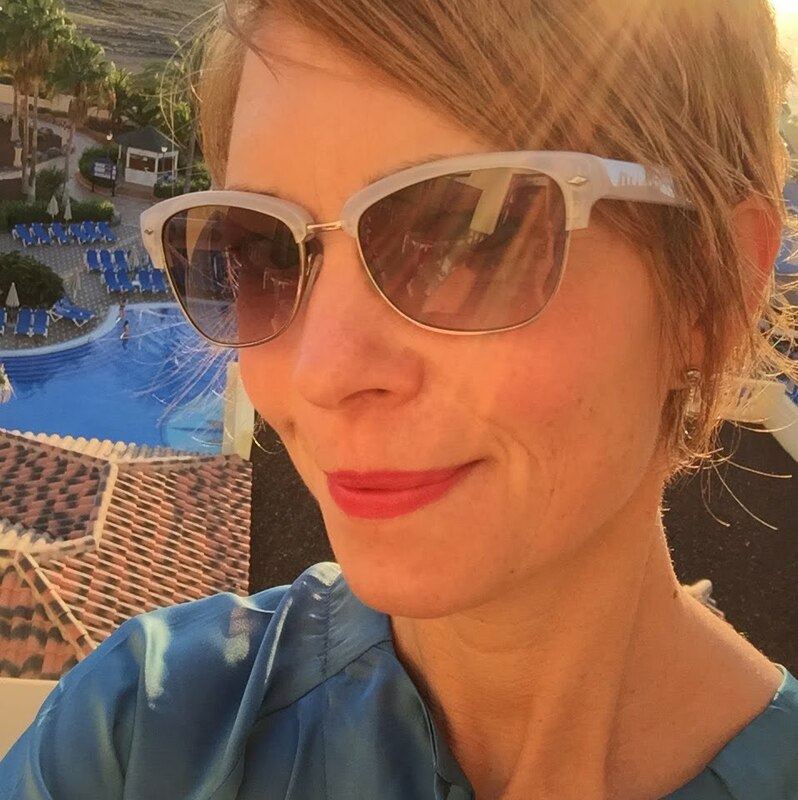 By way of a change, I thought that I would bring you three different items in this post - something to wear, something to eat and a little exercise thought or two. 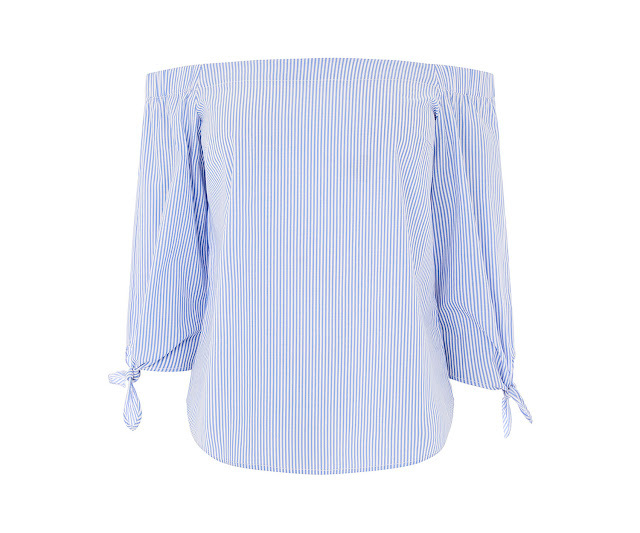 You all know how much I love anything pink - particularly a pink top or jumper (or front door) and so when I was shopping for some outfits for an upcoming event, this Sun, Sea, Sand Hush top (£40) might just have found its way into my basket. I haven't tried it on yet but it made me instantly cheery - and there would be something slightly ironic about wearing it when we're so far from the sea. One of the main observations in the "comments" section about this top on the Hush site, is that it is much brighter in real life than shown on the site - which is a fair comment when you compare the two photos above. 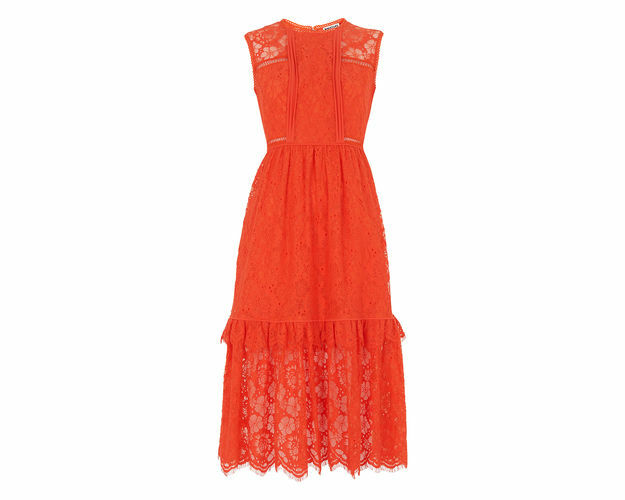 Anyway, if you're on the look out for a pink pick me up for your wardrobe, this could be it. And if you're looking for a snack time pick me up, these could be them! True, I know that they don't look the most appetising ever but I love them and the recipe makes loads, so you can pop a few in the freezer and always have a healthy snack at the ready. They are the raw vegan flapjack from Jamie's "Everyday Superfoods" but without the oil or the maple syrup. I find that if I soak the dates and dried fruit in warm water for a few minutes, they get nice and soft and absorb enough liquid so that the oil isn't necessary. I make these in the nutri-bullet in two separate batches or else it can't cope with all of the ingredients. Essentially I chuck in 200g oats, 100g hazelnuts, 50/100g other mixed nuts, 20g sunflower seeds, 100g dried fruit and 180g dates, whizz it up, roll it into humungous sized rabbit droppings and there we have about 22 power balls. They can be flavoured with cacao powder, or ginger, or other bits and bobs but I prefer them just as they come. And they're great to take out running with you...which leads me to my next part of this post. Running. In all its sweaty, heart-pumping, achingly painful (at times) but totally mind clearing and wonderful glory. For some crazy reason, I've entered the ballot for the London Marathon again. Now it's just a waiting game until the beginning of October to see whether I have a place. And in the meantime, I shall be training for the Birmingham Marathon, which is towards the end of October. It's the first time that we've had a Marathon in Birmingham and whilst I didn't think that I had another one in me, I did a few 20 odd milers with a friend in preparation for the Boston Marathon and it was OK - so what the hec? But at the same time as marathon training, I'm doing the "Couch to 5k" app with my husband. A more unlikely runner you couldn't find - only through lack of interest I should hasten to add. It's taken me 20 years to get him to come out with me! But he's done three runs now, he hasn't complained once and I reckon that he will be pretty nippy once he gets into the swing of it. It was his new resolution on reaching 50. So for anyone tempted, the app could be perfect - the worst thing is heading out, blasting around the streets for 400m and then collapsing in a heap never to go out again. This is a gentle, structured introduction that includes lots of walking as well. Oh, and the "Mind over Marathon" TV programme was brilliant. I loved seeing how running transformed the lives of those involved in such a moving and positive way. I would imagine that if you weren't sure whether you could get out there and do it (and I know that it's not for everyone) this might just be the thing to get someone to put on their trainers and give it a go. And of course non of us ever likes how we look in skin tight lycra but again, a splash of pink or coral - or some flowers and a few layers always helps. I'm still loving the way that my Prism Leggings and Seafolly Festival Hoodie (both available at Cocobay) feel when I'm running in them. These are my running staples but I also have a good splash of pieces from GAP, H&M and Primark for running in too - so it's really not necessary to spend a lot to get going.